Two years after we presented our first paper on Brian Eno’s production practice at the Music and Moving Image conference in New York, the Musicology Research Journal accepted my third collaborative work with Rupert Loydell which examines Brian Eno’s touchscreen music applications Bloom, Trope, Scape and the Reflection album release. 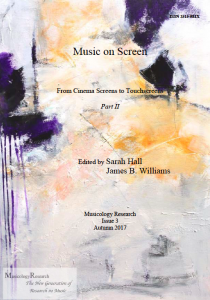 It’s open access and can be downloaded from Musicology Research Journal. Loydell, Rupert & Marshall, Kingsley. (2017) ‘Sound Mirrors: Brian Eno and Touchscreen Generative Music’. In Musicology Research. Issue 3, Autumn, 2017. No. 2, pp. 27-50. With the recent publication of the edited collection Brian Eno: Oblique Music (Albiez & Pattie, 2016) and the distribution of Brian Eno’s 26th solo studio album Reflection in 2017 on vinyl, CD and as an innovative software application, the time is ripe for a reconsideration of the way in which software has been used by the musician, composer, record producer and visual artist Brian Eno. This paper explores how Eno has used simple but innovative ideas and processes to inform his music over the course of his career, and considers how his work with collaborators – specifically the musician and software designer Peter Chilvers – has converged with the emergence of touchscreen technologies and modes of distribution. We will demonstrate how Apple’s App Store global distribution platform has further disseminated Eno’s ideas of ‘generative music’ to a wider audience through he and Chilvers’ Bloom (2008), Trope (2009/2015), Scape (2012) and Reflection (2017a) software applications for Apple’s iPhone and iPad, and the impact on the distribution and reception of Eno’s own music. Echoing Eno’s own processes of appropriation, remix and collaboration the authors wrote the paper through exchanges dictated by the turn of a card selected from the third edition of the Oblique Strategies deck, issued by Eno and Peter Schmidt in 1979.